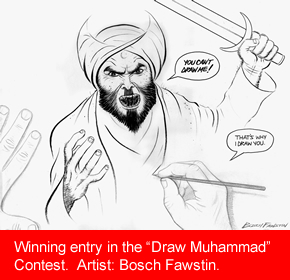 On May 3, 2015, a group of people assembled at the Curtis Culwell Centre in Garland, Texas to watch the announcement of the winner of a “Draw Muhammad” Contest. The organizers knew that some if not all Muslims believe that no person ever should draw Muhammad, and knew that some Muslims have murdered cartoonists in the past who have drawn or otherwise depicted Muhammad (see here, and here, as examples). Accordingly, the organizers spent something in the order of $10,000.00 on security for he event, which was closed to the public. Two men from out-of-state approached the Centre, shot a security guard in the ankle, and were promptly shot dead by a police officer. In the days that followed, most of the media thought the event to be an irresponsible, provocative, “baiting” of Muslims, and they actually expected the organizers of the event to be repentant for what happened. Tolerance of murder is not equivalent to tolerance of insulting speech. Sticks and stones and what not, eh? Were the murderers baited? Yep. Did the organizers hope they’d get the response they got: probably. Did the whole event prove anything useful? Absolutely: that there are living amongst us Muslims who will commit murder because of their religion. It’s not just folks in…well, almost every other country. It’s also folks living here. As to the morality of it all: I’m a strong believer in mouse traps. I just wish that they weren’t so expensive.